Authors: Tim Horbury and David Stansby at Imperial College London and Lorenzo Matteini at LESIA, Paris. 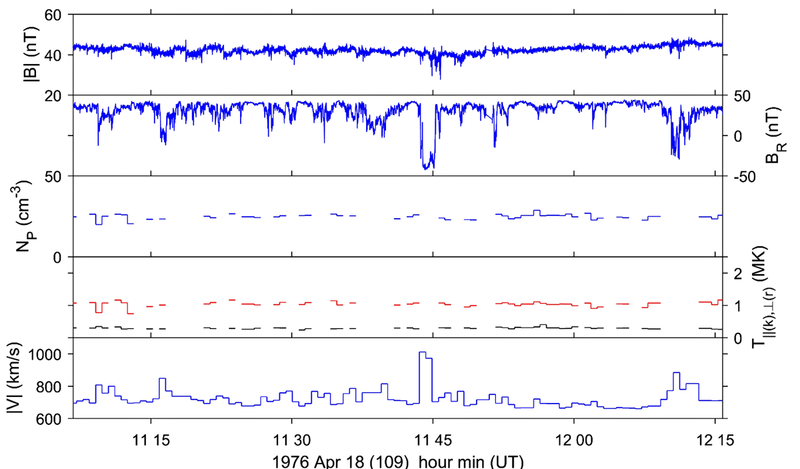 A re-analysis of old solar wind measurements, taken near the Sun over 40 years ago, has revealed the presence of short velocity “spikes” in the plasma, which can take its speed to over 1000 km/s. These discrete spikes carry a significant fraction of the total momentum and energy of the wind and have striking similarities to results from recent simulations of coronal jets, helping to explain the energy budget of the solar wind and raising the exciting possibility that we will directly measure these jet outflows with the upcoming Parker Solar Probe and Solar Orbiter missions. How does the Sun produce a wind, flowing at several hundred km/s, that fills interplanetary space? The solar wind is a hot, near-collisionless, nearly fully ionised plasma. We know the basics: that the hot corona, being at a far higher pressure than interstellar medium, accelerates away until it is super-sonic and super-Alfvenic, carrying with it the Sun’s magnetic field. The fastest, smoothest wind comes from coronal holes at around 750 km/s and it has generally been assumed that this is a steady-state process. Models (see  for a recent review) of the wind cannot achieve these speeds without the addition of large amplitude Alfven waves, which help to drive the plasma outward. 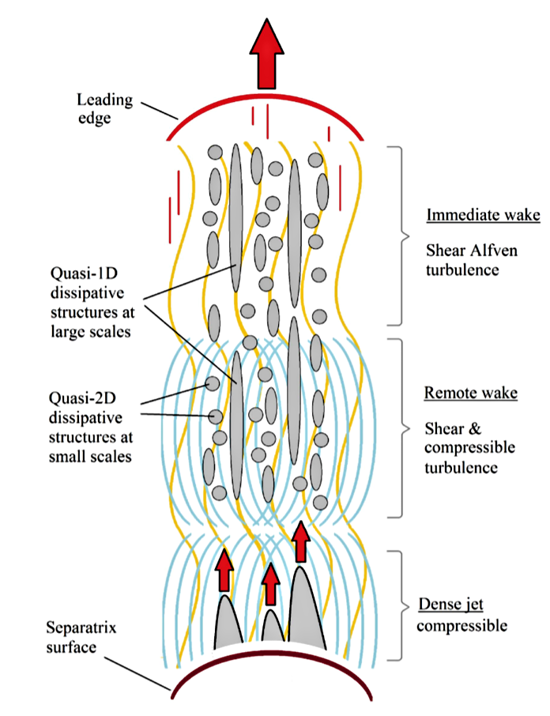 Theories of the origins of the Alfven waves in fast wind include footpoint motion driven by granular overturning, and broadband waves in the corona – which, if either, is correct? We are about to embark on a renewed exploration of the inner heliosphere, with the Parker Solar Probe and Solar Orbiter missions. 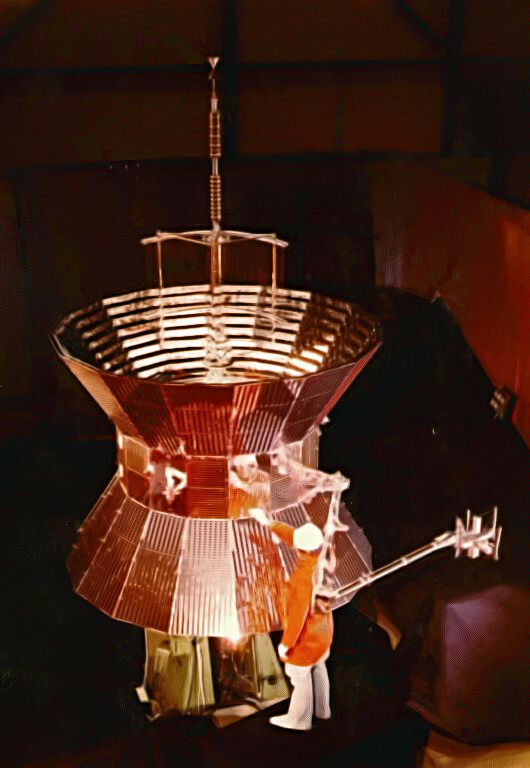 In preparation for the new data, the group at Imperial has been re-examining, using new methods, the closest measurements we have to the Sun, from the twin US-German Helios spacecraft in the 1970’s, see Figure 1. We have fully re-processed the proton measurements, and recently released the first publicly available reliable data set . Our work on high speed solar wind streams at just 60 solar radii  has revealed a population of short, large amplitude velocity increases (Figure 2). While we are limited by the 40s resolution of the plasma data, it is clear that these events are common (every ~20 minutes) and cover a broad range of sizes and amplitudes. They are no hotter than their surroundings and they are Alfvenic in nature, with correlated changes in the magnetic field and velocity. Figure 2. A velocity spike at 0.3 AU. From (3) - Horbury et al. 2018. Figure 3. Schematic of the signature of a coronal jet at different distances. From (4) - Uritsky et al. 2017. These results are qualitatively similar to recent simulations of the distant signatures of coronal jets [4,5: see Figure 3], where the plasma outflow rapidly merges with the ambient plasma, but the Alfvenic perturbation travels deep into the solar wind. Since the Helios spikes occur around 5% of the time, have an average kinetic energy 35% higher than the ambient wind and carry around 7% of its total kinetic energy, this implies that they are a non-negligible contribution to the total energy budget of solar wind from coronal holes. The short velocity spikes in the solar wind at 60 solar radii might be the long-sought signatures of coronal jets. If this were the case, it would open up the possibility of directly measuring these outflows and their properties and implications for the overall solar wind flow. In the very near future, measurements from Parker Solar Probe at 35 solar radii, nearly twice as close as those considered here, should reveal the fine scale structure of these velocity spikes. Combined with remote observations of the coronal source, either from near-Earth telescopes such as SDO or in future the Solar Orbiter mission, these data should provide unambiguous evidence for the origin of these enigmatic structures.